Southern West Virginia Health System provides quality care and serves as a leader in improving the health of our communities. Our vision is to be the best, most respected and trusted healthcare organization. The original founders of the Board of LPCC were local businessmen who understood that a medical practice could generate revenue to cover operating expenses and a surplus that would enable services to be provided to those who could not afford them. Unmet patient demand immediately surfaced as the capacity of the clinical practice grew. The community is proud of the fact that, in 1977, the Center was recognized as the nation’s first designated Rural Health Clinic (RHC) under Public Law 95-210. In 1991, the National Rural Health Association honored LPCC as the nation’s Outstanding Rural Health Practice. 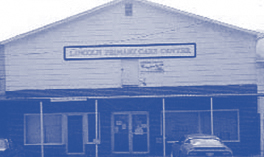 Lincoln County Primary Care Center, Inc. (LPCC) was incorporated in 1975 by local citizens as a non-profit community based rural health center. LPCC was established as a Federally Qualified Health Center “Look-Alike” (FQHC) in 1998. LPCC became a Federally Funded Section 330 center under the Health Resources Services Administration in 2002. By 1989, the Center was a well-established entity in the community and positioned to initiate a capital campaign to construct its current 17,500 square-foot building. This facility houses LPCC’s clinic and leases a portion of its space to the Lincoln Volunteer Emergency Services – the county EMS operation. In January 2004, LPCC expanded services to include a Wellness Center to provide community members multiple options for dealing with chronic disease and preemptively address populations at risk for chronic disease through prevention. In 2010 Lincoln Primary Care was awarded a Service Area Competition grant award from the Health Resources Service Administration for Logan and Mingo Counties. As a result LPCC created Southern West Virginia Health System (SWVHS) to encompass the new service area and opened numerous additional clinics to serve patients in these communities. During the past six years SWVHS opened new clinics in Chapmanville Regional High School, Logan High School, Man, Gilbert, Salt Rock, Logan, and Delbarton, WV. Also in 2010, SWVHS received a HRSA grant to complete construction of a modern 16,000 square foot facility on Sand Plant Road off of Corridor G in South Charleston. The building houses family practice, urgent care, 340-b pharmacy, laboratory, behavioral health, administrative and training capacity. In 2015 LPCC opened its fourth 340b pharmacy located in Hamlin, WV and in 2016 the organization opened school-based health centers at Midway Elementary, Ranger Elementary and Man Elementary/Middle Schools. LPCC is working to complete construction on a modern 10,000 square foot building in Man, WV with the financial assistance from the office of the Governor, the Logan County Commission, and private funding secured by LPCC. LPCC has run the gamut in its development as a community-based primary care organization. It has progressed from being a foundation grant and revenue driven organization, with medical professional placement support from the National Health Service Corps, on to Rural Health Clinic status, a Federally Qualified Health Center “Look-A-Like” and now a designated Federal Section 330 site. As our mission, vision and values attest we are committed to serving our communities and feel beholden to improving the lives and wellness of those we serve.